If the references to Paddy Hopkirk and 33 EJB mean anything to you, then you’ll no doubt also get today’s Nice Price or Crack Pipe Mini MC40. That’s because it’s a homage to the Monte Carlo rally winning Minis of the ‘60s. Let’s see if you also can dig its price. Okay, I want to start out by talking not just about last Friday’s 2003 Acura RSX Type-S, but also about that Alfa we featured on Wednesday, since the latter car is possibly not what its seller purported it to be. We’ll get the Acura out of the way first: It garnered a 57 percent Crack Pipe loss for its $5,100 asking. There, done. Now, about that Giulia. The ad for the barely two-year old 2-litre claimed its title to be clean. It’s a little difficult to confirm that now on Craigslist since the seller has pulled the ad. Fortunately, I have a copy—for, as Foghorn Leghorn once said, just such an emergency. As it turns out, a number of people had checked the car out owing to its oddly low price. Those who smartly did a VIN check discovered that the seller’s interpretation of “clean” might not fully in parallel with that of the OED. It seems that the car was reported as a total loss in June of last year due to damage suffered in a collision. The car was apparently repaired and following that received a new title. If that’s all true and none of it was prefaced in the ad well, Bob is apparently and unequivocally not your uncle. I guess we all need to make sure our caveats are all fully emptor’d in the future. 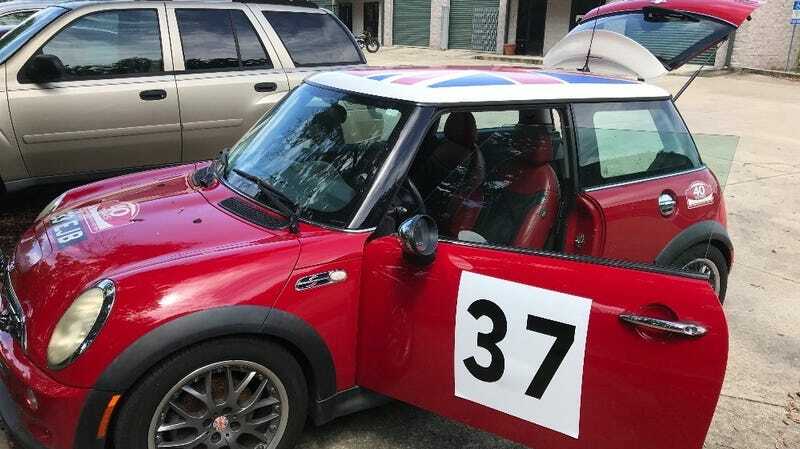 Hopefully the seller of today’s 2004 Mini Cooper MC40 Edition is being fully forthcoming about its provenance and its condition. If you watched the Wheeler Dealers episode from last season with one of these then you’ll know that it was the first special edition of the new generation of Mini and, appropriately as such, paid homage to the original BMC Mini’s rally successes of the ‘60s. Many of those came at the hands of rally legend, Paddy Hopkirk, and this MC40 is in fact named for the 40th anniversary of Mini’s victory at the 1964 Monte Carlo rally and carries Hopkirk’s signature on its series plate. What makes the MC40 and MC40? Well, for starters it was based on a base Mini with no sunroof to save weight. That was painted in Chili Red with a white roof and was fitted with 17-inch Anthracite-hued R90 alloys. Additional exterior MC40 bits included bonnet-mounted driving lights, chrome trim, and magnetic “37” and “33 EJB” decals honoring Hopkirk’s car. Inside, special read and black leather seats face a carbon fiber-trimmed dash, along with an upgraded gauge package and the aforementioned series number plate. Power for the MC40 comes from Mini’s 1.6-litre SOHC 16V four to which has been appended a Roots-type supercharger and air-to-air intercooler. That saucy combo raises 163 horsepower and 155 lb-ft of torque out of the little mill. A six-speed manual backs that up and the ponies are pressed into service via the front wheels only. At just a little over 2,600 pounds that’s an engaging combination. I mentioned last season’s Wheeler Dealers episode where they took on an MC40. Their car had 95K on the clock and the biggest concern Mike and Ant had was that the impending 100K service would eat so deeply into their expected profits that they might have to sell their beloved tea kettle. Luckily, Ant was up to the task of doing the service himself and through the magic of TV editing, he finished off the various maintenance services in what he says was about a weekend’s worth of time using commonly accessible tools. One of the biggest issue with the Mini is its accessibility, and that’s why the dealer charges a ton to do the 100K service since there’s so much that has to be removed to make room to do the work. This MC40 doesn’t seem to have the issues that afflicted the Wheeler Dealers car, and with just 84K on the clock there’s plenty of time to amass the parts and the knowhow to tackle that 100K service yourself. The car comes with all its decals (or deh-cuhls as Mike calls them) and badges. The seller says that it “looks and drives great” and is fully accident free. Also noted in the ad is some recent maintenance that has “fixed all the little glitches and leaks so it is mechanically sound.” According to the console-mounted badge it’s #80 out of the 1000 MC40s Mini built in 2004. The interior seems to have held up well, with clean and solid leather and no major issues obvious in the carpet or MC40-branded mats. The exterior is also clean, but is slightly spoiled by clouded headlamps. A good detailing would likely do the car wonders. Also, the rear Mini badge is as faded on this car is it was on the Wheeler Dealers car. The price is $7,000 which is a good bit more than what Mike and Ant spent on theirs, but then it had a few issues and was in need of that 100K service. Their final selling price was $9K, after all Ant’s antics. This one’s fully $2K less, and has a few more miles to go before it may need the major service. Your service is to decide if that $7,000 price is a deal or not. What do you think, could this homage Mini claim that much cash? Or, is this MC40 a small car that’s got a too-big price? AutoTrader out of Daytona Beach, FL, or go here if the ad disappears. For $6,000, Does This 2008 Mini Cooper S 4X4 Rise To The Occasion?